Yellow Pre-Wired Repair Tags - #5, 4 3/4 x 2 3/8"
Red Pre-Wired Repair Tags - #5, 4 3/4 x 2 3/8"
Yellow Pre-Wired Repair Tags - #8, 6 1/4 x 3 1/8"
Red Pre-Wired Repair Tags - #8, 6 1/4 x 3 1/8"
Repair tags are useful for any business that handles repairs or maintenance. They help you keep track of your work and can be easily split into two parts, with one portion going to the customer and the other staying on the product. 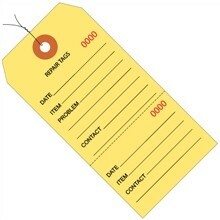 We offer pre-wired repair tags, so they are incredibly simple to use. There’s no need to stock wire separately or struggle to find a wire or a string when you need it. Plus, these tags are consecutively numbered and come in different colours to make organization easy. The Packaging Company has a long and successful history of helping businesses succeed. We’re a one-stop-shop for packing, shipping, and organization supplies. We’re here to help your company get the products you need quickly and at a fair price so that you can get back to work. We know you don’t want to spend a lot of time, effort, or money looking for a reliable supplier that stocks the items you need. That’s why we offer an extensive and diverse product line of tags and much more. You can trust the Packaging Company. We also understand how important high-quality customer service is. We want to talk to our customers and help them with whatever problems or questions they may have. 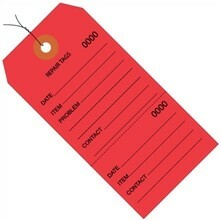 If you’d like more information on anything we sell - such as our pre-wired repair tags - or if you have a shipping or organization issue that you’re not quite sure how to solve, do not hesitate to contact us. Give us a call or send us an email. We’ll be more than happy to speak with you and help you out in any way we can. Whether you’re looking for repair tags or interested in any of our other products, you can trust the Packaging Company to have what you need.